Yellow Mach 1 is back again! › Yellow Mach 1 is back again! You can trace the circuit on the wiring diagrams. The "throttle position solenoid" wasn't used in 1971, and came about in 1972 as a result of emission regulations, which led to lower compression and changed cam timing. The result was "dieseling", or run-on after the ignition was turned off. The solution was to add the solenoid, which sets key-on idle speed and closes the throttle blades when the key is turned off. The "throttle position solenoid" circuit is #604, red/yellow stripe, and connects to circuit #16, red/light green stripe, which is the circuit that provides power to the coil from the coil run position on the ignition switch. 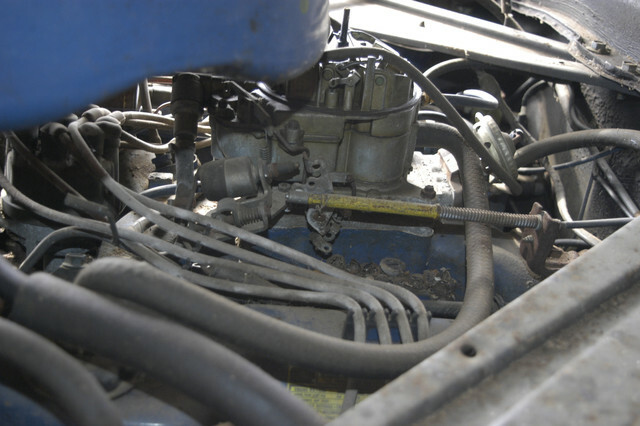 If the engine is stock, except for the manifold and carburetor, and has all of the original emission controls connected it is likely the solenoid will be needed. If the engine is stock, but has all emission controls removed, there's a good chance it will still be needed, but worth trying it first. I believe the bracket used to be available for Holleys. (02-05-2019, 10:16 AM)Don C Wrote: You can trace the circuit on the wiring diagrams. The "throttle position solenoid" wasn't used in 1971, and came about in 1972 as a result of emission regulations, which led to lower compression and changed cam timing. The result was "dieseling", or run-on after the ignition was turned off. The solution was to add the solenoid, which sets key-on idle speed and closes the throttle blades when the key is turned off. Don, this is a bone stock 71 with less than 60,000 miles. I believe the solenoid is from the factory on this car. Most everything under the hood is factory. Why would this 71 have it? Disc brakes all way around. Is it a California car? Would there have been additional emissions stuff in 71 for Cali that this car would have had this? Bought new in Texas and spent its entire life there til couple years ago. Good question, the only '71s that I could find that have it is 6-cylinder engines, after looking through 3 different wiring diagrams and the '71 shop manual. The V8s had anti-stall dashpots. Easy enough to figure it out. With the key on, and AC off, check for voltage to the solenoid, if none, then with AC on. If the battery isn't connected, check for continuity between the positive battery cable and the wire to the solenoid, key on with AC off. (02-05-2019, 10:48 AM)Don C Wrote: Good question, the only '71s that I could find that have it is 6-cylinder engines, after looking through 3 different wiring diagrams and the '71 shop manual. Thanks! Makes sense and easy enough to check! So frustrating to have to patch a paint work done not long ago. This inner wheel /quarter is a real pain. Once the rust is there, it's an endless fight till you separate the 2 sheets and somehow manage to have some kind of water/air tight isolation in between. I did similar patches there on the 73 and as I have similar work to do on one side of the 71, I'm considering this patch. (02-05-2019, 11:05 AM)Fabrice Wrote: Nice work! Yeah its a pain but gotta make it right. I did make the patch myself and if you look at the pic where I cut it open you can see the new inner wheel well I replaced when it was first painted. I have a couple 351 cars with air. The solenoid is like stated to close butterflies completely to cut off the air to stop diesel. One car had the same intake you have put on it by PO and he did not put it back on. Sorry, I for some reason thought it was an idle solenoid that kicked in when a/c turned on. But that makes more sense that’s it’s for emissions and that wire is only hot when key is turned on. Learn something new every day on here!